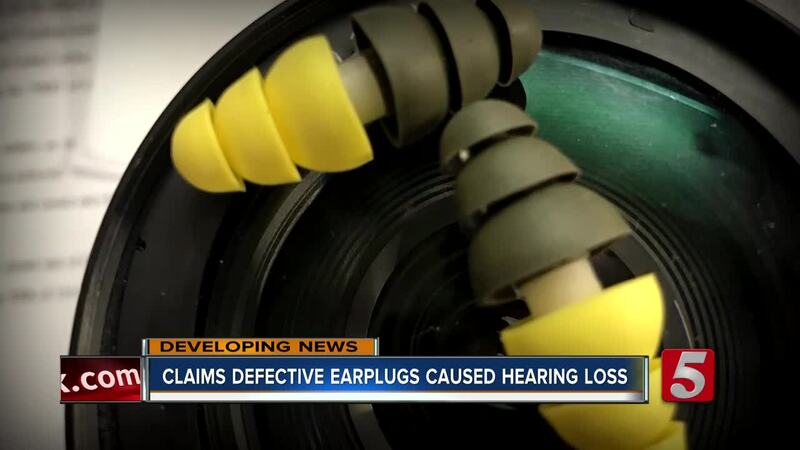 NASHVILLE, Tenn. (WTVF) — Two U.S. Marine veterans filed a lawsuit on Friday alleging that their hearing was damaged because of defective earplugs manufactured by the 3M Company. These are the earplugs that were sold to the U.S military for more than a decade and that last summer led to a $9.1 million settlement by 3M to the U.S. Department of Justice over the defective dual ended combat earplugs. Goodlettsville attorney Tim Bowden filed the lawsuit in U.S. District Court in Nashville on behalf of Nashville residents Christopher Wade Phillips and Eric Wayne Lewis. Both men served in the U.S. Marines on overseas combat deployments during which time they were issued and used the defective 3M combat earplugs. Phillips joined the U.S. Marine Corps in 2001 at age 18. He was deployed to Iraq and Kuwait in 2003 and served with distinction until he was medically discharged in 2004 with a forty percent (40%) hearing loss. Lewis also joined the U.S. Marine Corps at the age of 18, in 2002. He was stationed at military bases in Georgia, Virginia and North Carolina and served combat deployments to Iraq in 2005 to 2006, and two deployments to Afghanistan, one in 2011 to 2012 and again in 2013, serving with distinction until his discharge in 2014. "It's disheartening to hear," Lewis told NewsChannel 5. "Being in the military we always expect our gear to work." “Due to the widespread damage caused to our military personnel by 3M’s actions, cases like this are just the tip of the iceberg of lawsuits that will be filed to hold 3M accountable,” Bowden said. According to the lawsuit 3M employees allegedly knew about the earplug defects as early as 2000, yet continued to provide them to U.S. military personnel like Lewis and Phillips for use through 2015 or later. A jury has been requested to hear the lawsuit. The lawsuit seeks to recover both actual and punitive damages from 3M on behalf of Lewis and Phillips. Although testing conducted by 3M discovered that the earplugs were defective, the company claimed that the testing complied with military standards. "If there's something we can do to protect our military heroes, our men and women, who worked so hard to protect our way of life in some small way, we can hold this company accountable for the fraud," Bowden added. The lawsuit joins hundreds of others across the country. Bowden said a Minnesota judge will be hearing the cases. His firm has established a website, www.militaryhearinglawsuit.com, to assist others who may have been issued the defective ear plugs.